I have recently written two articles, The Coming Battle for Damascus, and a follow-on piece, The Coming Battle for Damascus - Addendum. There will be a Battle for Damascus, and I predict when it is all over, the Syrian people will have overthrown the dictatorial party that has ruled the country for five decades. That is a good thing, but that victory will lead to the second battle for Syria, the "Battle after Damascus." In the beginning of the Syrian revolution, which has just entered its third year, the various grass-roots opposition groups united under the banner of the Free Syrian Army (FSA). The FSA was a loose amalgam of local groups across the country. It was not long before military officers who had defected to the FSA, bringing with them military organizational skills, began to coordinate the disparate operations and begin to bring a quasi-military structure to the group, forming battalions, then brigades. Just this last week, we saw the creation of the FSA's First Infantry Division in the Damascus Countryside governorate. Not long after the creation of the FSA, foreign fighters began to join the fight, and some elements of the loosely organized FSA began to appear more Islamist. Watching the hours of videos posted to sites like YouTube and LiveLeak, I noticed the clips showed increasing instances of Islamist chants and the appearance of the black Islamist flag normally associated with al-Qa'idah and its affiliates. It came as no surprise when the Jabhat al-Nusra (Victory Front) declared its affiliation with al-Qaidah, followed by the joint declaration of the Front and the Islamic State of Iraq (also known as al-Qa'idah in Iraq) that they had formed a joint organization called The Islamic State in Iraq and the Levant. Why has the FSA decided to cooperate with the Islamists? Simple - they offered capable assistance and support while the West, including the United States, sat on the sidelines, or offered "non-lethal" aid. I watch hours of Syrian opposition videos everyday - the term ghayr qatali (non-lethal) has become a joke among the Syrian fighters. Do the more secular Syrians who make up the bulk of the FSA want an Islamic state in Syria after the fall of the Bashad al-Asad regime? Probably not, but right now is not the time for that battle. The secularists and Islamists are locked into an uneasy alliance based on a common enemy - they have decided that they will cooperate for now, knowing full well that there will be a major ideological clash in the future. There will be a fight over the future structure of the follow-on government of Syria. That battle will follow the coming battle for Damascus - the future of Syria will be decided in the streets of Damascus. The FSA is aware that they may have mortgaged a piece of their future to the Islamists. Many of their supporters are not happy about it and have expressed their displeasure with the FSA leadership. The Christians - Arab, Assyrian and Armenian - are wary of supporting the FSA, but many have thrown in with the FSA. Most of the Kurds have reluctantly gone along as well. However, there are secularists who are taking a hard line against the Islamists. 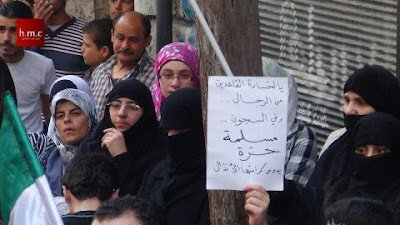 The picture above of a group of women holding a sign the northern city of Aleppo illustrates the point. For my fellow Arabic linguists, the language is a bit awkward - it is a poem and it must rhyme. And to trample their dignity would make them (the al-Qa'idah) despicable." There is no illusion among the secularists that there is not another fight ahead of them. It too will not be an easy struggle. There is widespread reporting about Iraq's third inspection of Iranian cargo aircraft bound for Damascus in just the past three days. 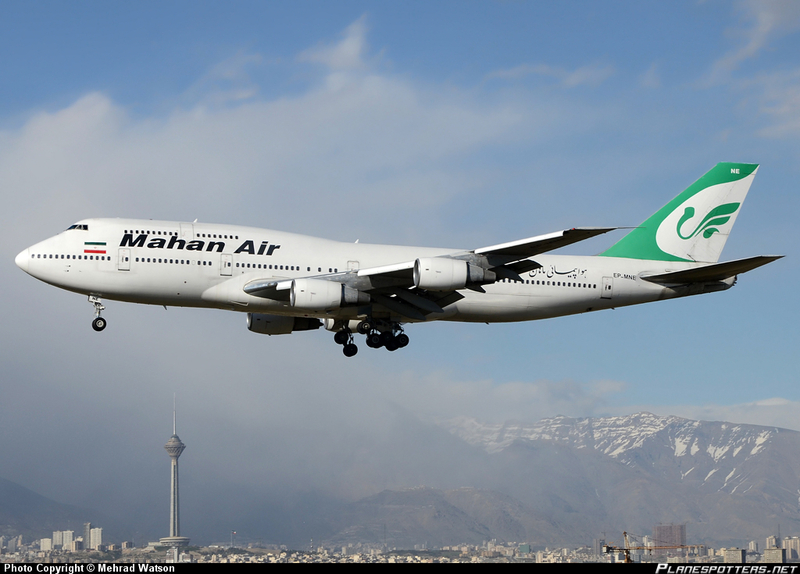 This particular flight was a Mahan Air Boeing 747, similar to the one pictured above. These "inspections" are in response to the recent visit of U.S. Secretary of State John Kerry to Baghdad. On March 24, Kerry met with Iraqi Prime Minister Nuri al-Maliki and almost demanded that Iraq stop Iran from shipping arms to Syria through Iraqi airspace. "Anything that supports President Assad is problematic,” Mr. Kerry said, adding that the Iranian flights were "sustaining the government of Syrian president Bashar al-Asad." If it were not such a serious issue, Kerry's naivete would be humorous. A virtual neophyte in Middle East matters, Kerry presumes to explain regional politics to the prime minister of Iraq. 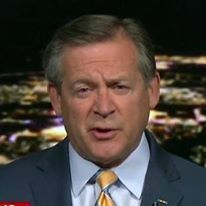 Specifically, he tells pro-Iranian Prime Minister Nuri al-Maliki - known in Iraq derisively as "Nuri the Iranian" - that allowing Iranian flights to transport weapons, supplies and personnel to Iraq is supporting the pro-Iranian regime of Bashar al-Asad. Do we see a theme here? Iran, al-Maliki and Bashar al-Asad are on the same side. Why does Kerry not seem to know that? Again, a neophyte in things Middle Eastern, Kerry probably believes the Iraqi accounts of what has happened this week. Three Iranian flights have been asked to land while transiting Iraqi airspace for inspection to ensure weapons are not among the cargo. In all three instances, Iraqi officials have found only "humanitarian goods" on the planes. True to form, the Iranian government has called the inspections “unacceptable," and vowed to continue its "relief operations" in Syria despite the inspections. Mr. Secretary, surely you must know this is theater for your benefit. The Shi'a-dominated government of Nuri al-Maliki is in the pocket of the Iranians - al-Maliki takes his orders from Tehran. Iran is the Syrian regime's primary supporter - the two countries have had close relations since Syria supported Iran in its eight year war with Iraq in the 1980s. There are two scenarios that may be in play here. The Iranians may have told the Iraqis which planes are not carrying weapons and Islamic Revolutionary Guard Corps fighters, and the Iraqis are selecting these for inspection. Alternatively, the planes are carrying weapons and the Iraqis have been told to look the other way. Either is possible, although I suspect it is the former. I also question the use of Mahan Air for resupply to the Syrians. In the past, they have used Iranian air force Boeing 747 cargo freighters, just as they have for decades. If you honestly believe that your admonition to Nuri al-Maliki has stemmed the flow of weapons from Iran to Syria via Iraq, you really are naive.